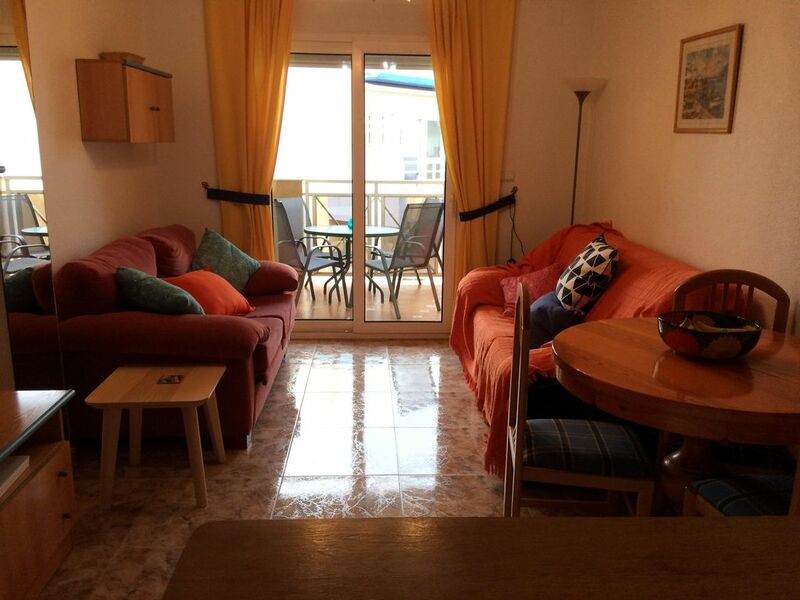 2 bedrooms, 2 bathrooms, top (3rd) floor apartment with balcony in clean, modern, spotless seafront apartment block. Family friendly with lifts. Travel cot available on request. Air conditioning. Rooftop terrace with stunning sea views. Underground parking. Beautiful apartment block private pool overlooking the Mediterranean with several lovely, safe beaches within walking distance or short drive. Lovely promenade along the seafront to walk or explore. Local markets several days a week. Travel: Murcia airport 25km. Alicante airport 70km. Airport pickups can be arranged. Car not necessary but recommended if you want to explore. Apartment: Satellite TV, DVD player, Broadband Towels and bedlinen provided. Balcony with table and chairs (morning sun until abut 1pm). I double bedroom, I twin bedroom. Sleep sofa. Travel cot can be arranged. Restaurants and Bars: Plenty of cafes, restaurants and bars in immediate area. All tastes and price ranges including Thai, Italian, Mexican, Spanish, Indian, Chinese, English. Most bars and restaurants have free internet access. Several sports bars with large screen TVs. Banks and cash points in immediate area. Beaches: 2 within 10 minutes walk along promenade. 4 or 5 others including Cabo Roig and La Zenia are short drives. All are clean and safe with life guards. Some have beach bars. Golf: Short drive to excellent Real Club Campoamor, Las Ramblas and Las Colinas Golf and Country Club. Go Carting: short 10 minute drive. Shopping: Modern supermarket and general stores 5 minutes walk. Street market next to apartment block on Thursdays. Street markets in nearby towns on other days including in San Javier and San Pedro. Local Patisserie. Large new shopping mall 10 minutes drive. Several smaller shopping centres within short drives. Visit: Torrevieja - large Spanish town 20 minutes drive north. Promenade, beaches, boat trips, restaurants, afternoon/evening market. San Javier - 15 minutes drive south and San Pedro - smaller Spanish towns. Murcia - Historical city with hot springs. The apartment is well located for the restaurants and the beach and is well sized for a family of 3 or 4 with 2 bathrooms and indoor and outdoor eating areas. There is a well maintained communal swimming pool with a lifeguard. Satellite TV and broadband has recently been introduced and there is air conditioning in both the living area and the main bedroom. A fan in the twin room would have been nice. Deck chairs are supplied to take to the pool and beach and there is also a parking place in the underground carpark although you can normally park on the road outside. There is an excellent street market directly outside the apartment block on Thursdays. Only constructive feedback would be that a little maintenance and TLC is required to present the apartment better.